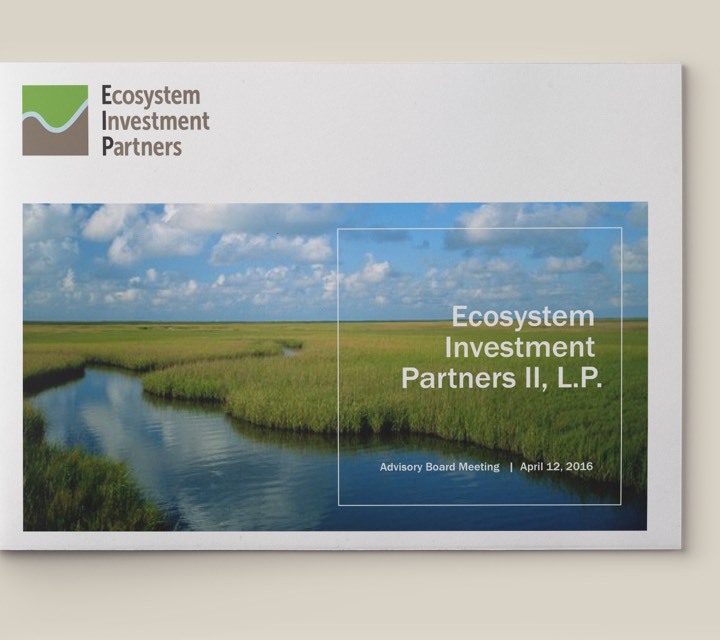 Ecosystem Investment Partners is a leading private investment firm focused on land-based environmental offset markets. 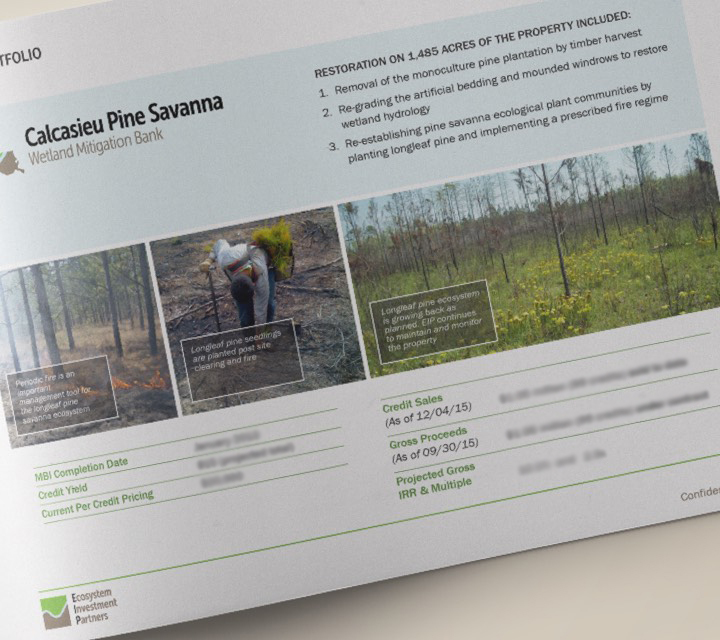 EIP operates at the confluence of environmental and economic interests, acquiring and restoring ecologically degraded properties to generate credits that developers buy to offset impacts from their projects. All are important to EIP’s success, and each has its own distinct information needs. Our first task was updating the brand, starting with the cornerstone: the corporate identity. We collaborated with members of EIP’s leadership team to realize their vision. The result was a mark with a more institutional feel. 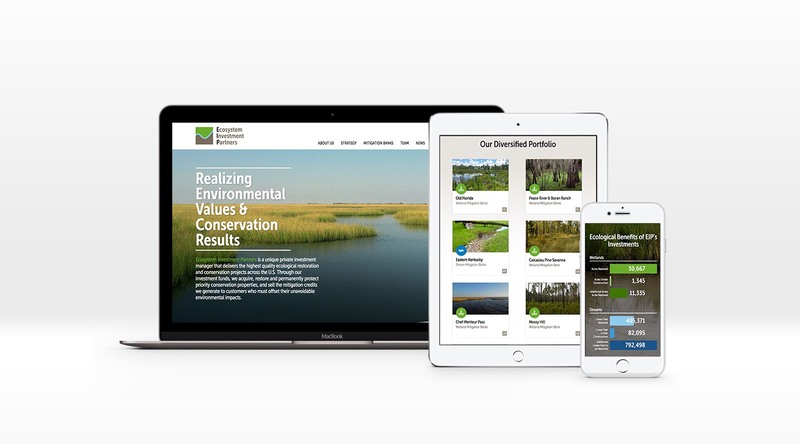 The new logo can be seen in two ways, reflecting EIP’s focus on delivering results for both investors and the environment. The blue line evokes a plot of land bisected by a river as well as a financial performance chart. This new logo provided us with a brand theme that we could apply to EIP’s portfolio properties. The result was a unified brand presence, across all projects. EIP’s primary channels for marketing to prospective investors are its pitchbook and corporate website. We produced a series of template slides for the pitchbook, developing a visual language that reinforced the new branding. We applied the same look and feel to the website, which was completely rethought. In addition to covering all the key topics for any private equity site—including investment criteria, process, and team—we needed to educate investors on the new asset class and its appeal. Generally speaking, credit buyers are developers seeking to secure environmental permits quickly and cost-effectively to keep their projects moving. Many retain consultants to help them comply with environmental regulations that mandate offsetting unavoidable impacts.  Developers have multiple options for meeting this requirement, so we needed to explain the benefits of buying offset credits from EIP. We created templates to build microsites for each mitigation bank that would quickly provide the information developers needed while touting EIP’s industry leadership. 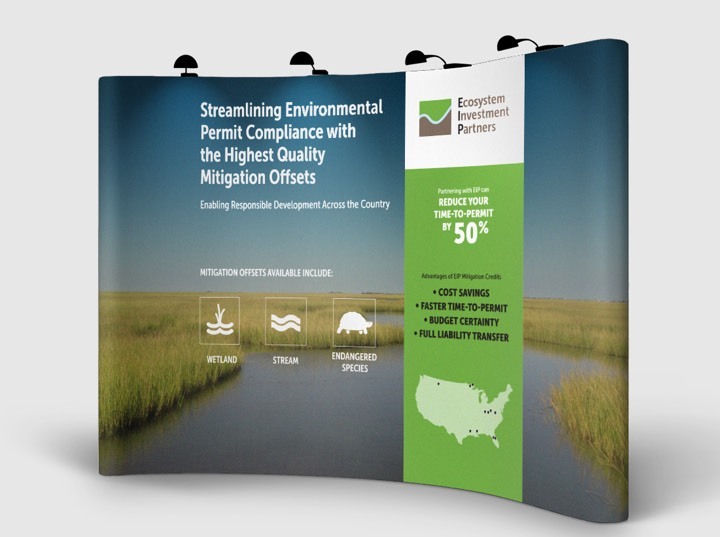 Sales collateral, advertising, and trade show graphics communicated those same messages. 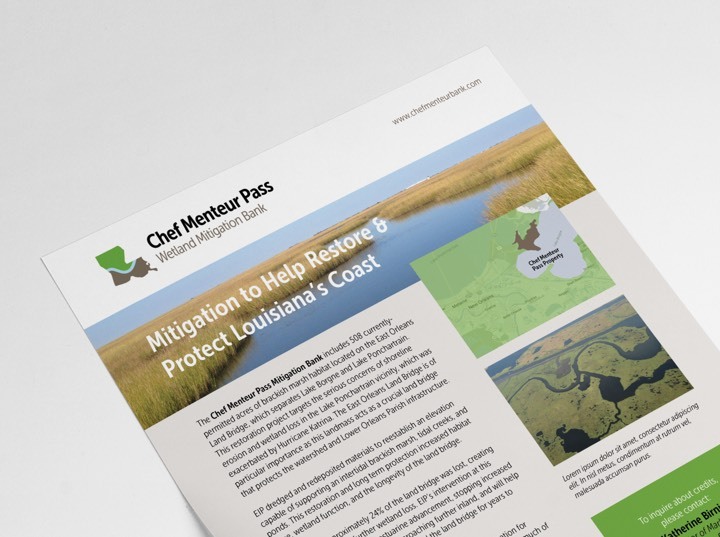 "…history of high-quality mitigation projects…"
EIP works closely with regulatory agencies and non-governmental organizations focused on the environment. Regulators must approve EIP’s projects, and both groups are sources of potential property acquisitions. 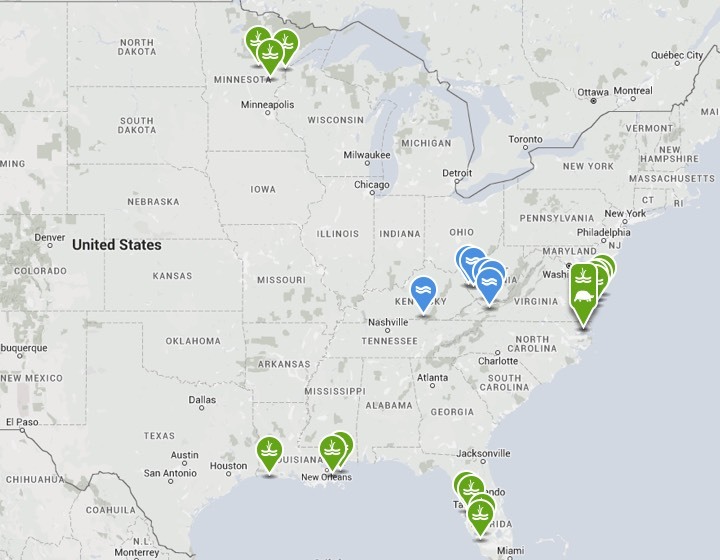 The corporate website educates these stakeholders about EIP—communicating its unmatched capabilities, successful track record, and national footprint. 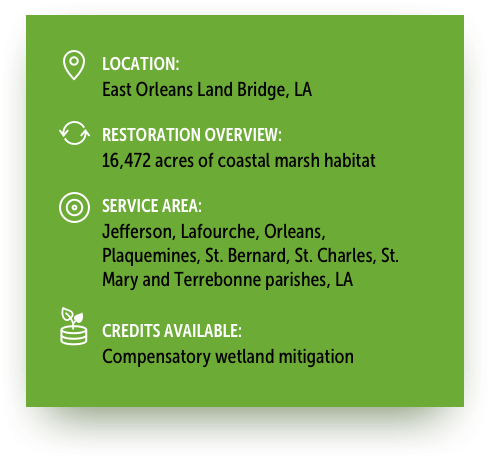 The mitigation bank sites also serve as a resource for regulators, who often look to them for property-specific details.